There are many reasons to love Summer Streets in New York—or open streets programs in most cities across the country—but one of the best is the opportunity to stand in the middle of Park Avenue, Fourth Avenue, or Lafayette Street gawking up at the city’s architecture without becoming roadkill. Walking Off the Big Apple presents a list of notable buildings along the route in easy to use Google map form. Summer Streets is back again tomorrow and the following Saturday from 7:00 a.m. to 1:00 p.m., so look for Mies’ Seagram Building, Stanford White’s 23 Park, or, of course, Grand Central Terminal. Also be on the lookout for this crazy bike-powered musical instrument called the Cyclo-Phone (above) by Marcelo Ertorteguy and Sara Valente. 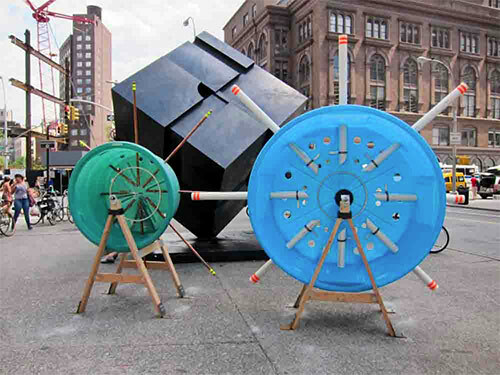 Curbed New York spotted the crazy contraption made of kiddie pools and PVC pipes at Astor Place.